Really? Death Machine over Dolores Claiborn? You think I am thinking of Hardware...? Oh, wait, there is another film called Death Machine that you reviewed here once, right? That is indeed not the one I mean. The Death Machine I am thinking of wa directed by Stephen Norrington, who later directed Blade, in 1994. The year is 2003. Chaank Industries, ruthless world leaders in future weapons technology, hires a new chief executive, Hayden Cale. Cale soon uncovers a secret and unethical weapons project the company is involved in and her first order of business is to shut it down. Her troubles begin just as she also tries to fire the company's technological mastermind, Jack Donte - a childlike psychotic with a dark genius for exotic weapons design. Donte retaliates by unleashing into the corporate headquarters the Death Machine, the ultimate killing unit! A weapon that tracks its target by sensing fear and has the power to rip through walls with its hard steel strength and razor teeth. Joined by two unlikely allies, Cale must wage a desperate bloody battle with the terrifying force that has no mercy, no pity and no fear. And yes... it was directed by Stephen Norrington. I watched the trailer in profiler for it... while it looks like it could be pretty good... not really something I am in the mood for this morning. But I will keep it in mind to watch soon after I complete this movie challenge. Selena St. George stares at the note and news clipping: her estranged mother Dolores has been accused of murder. Grudgingly, Selena returns to her tiny Maine hometown to offer help. Not that she believes Dolores is innocent. In truth, she harbors suspicions going back 20 years. 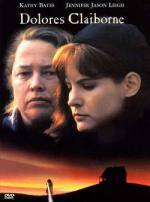 Kathy Bates, who won a Best Actress Oscar® for Misery,† scores in another Stephen King story (directed by Taylor Hackford) as tough-talking Dolores Claiborne. Jennifer Jason Leigh is wrenching as embittered Selena. The two circle warily, piecing together past and present, memory and fact, to reveal the startling truth behind two mysterious deaths. This is a movie I have never seen before today. But I have been hearing how good it is for years. So been wanting to see it for some time now. I just hope I am not going into this one with too high of expectations. Before putting the movie in I watched the trailer in profiler... which made me want to see the movie even more. Then I glanced at the cast list to see if there was any other big names in it besides Kathy Bates and Jennifer Jason Lee. And I was a bit surprised to see the name Ellen Muth as a Young Selena (Jennifer Jason Lee's Character). For those of you that don't know or remember... Ellen Muth starred in the series Dead Like Me as George Lass... the recently dead girl turned reaper. This is the first thing other then Dead Like Me that I had the chance to see her in. This movie was quick to grab... and keep my attention. Until the opening credits showed it... I completely forgot that this movie was based on a Stephen King novel. But I shouldn't be surprised as much as I enjoyed it... as I have always enjoyed all of the movies and miniseries I have seen based off his work. I thought that the entire cast did a wonderful job on this one. I also liked the way they told the story... bringing out what they needed to as they needed to do so. Superbly using flashbacks. And that is coming from someone that don't usually like flashbacks in movies. But when done right they can really help to advance the story. And they were definitely done right here. This turned out to be a great movie to start the day off with. If you are like me... and never gotten the chance to watch this movie... I highly recommend it! In this year... DISH Network, a Direct Broadcast Satellite service, is launched in the United States by EchoStar... TV Land, an offshoot of Nick at Nite devoted to round-the-clock airings of classic television shows, launches in the United States... Five years after its series finale, a one-off movie of Dallas, entitled Dallas: J.R. Returns, airs on CBS...Zenith introduces the first HDTV-compatible front projection TV in the U.S. Though my copy is the double feature with part 3. Why they skipped over part 2 and used part 3 in the double feature... who knows! Unfortunately it seems my mood for movies came to a screeching halt this weekend. Not sure why. So I doubt I will get to the year 2000 this weekend. But I will still try to watch some more this weekend. You can get the part two cheap (less than 4$ new) at Amazon marketplace if you want to complete the serie. The soaring adventure of a 13-year-old girl and her estranged father, who learn what family is all about when they adopt an orphaned flock of geese and teach them to fly! This is another movie I haven't seen until now. I wanted to watch this one with my daughter... but she wouldn't have any part of this one for some reason. But I still enjoyed it quite a bit... even if I did have to watch it on my own. The father being an artist/inventor did make him out to be a bit out there... but I guess he had to be where the story had to go. I really liked Anna Paquin in this early role... probably one of her first roles... as the teen age girl that had to fly the geese south for the winter. I really became a fan of hers after seeing her in the Showtime series True Blood. So it is pretty cool seeing her in such an early role. I also liked Dana Delaney as the father's girlfriend. As I said... I really enjoyed this one. A real feel good type movie.